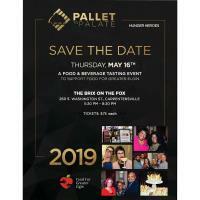 Elgin, IL—Food For Greater Elgin (FFGE) will host its sixth annual Pallet to Palate: Hunger Heroes fundraiser on Thursday, May 16 at The BRIX on the Fox. Individual tickets to Pallet to Palate are $75 and will be available for purchase beginning April 8 at www.foodforgreaterelgin.org/p2p. All proceeds will fight food insecurity by funding the mission of Food For Greater Elgin.